The Voting Units SS822Z, SS823 and SS832 have been specifically designed to work as a control unit within a redundant power supply configuration. The output connections from two Power Supply Units are connected to the Voting Unit. The Voting Unit separates the redundant Power Supply Units, supervises the voltage supplied, and generates supervision signals to be connected to the power consumer. Green LED’s, mounted on the front panel of the voting unit, provide a visual indication that correct output voltage is being delivered. Simultaneously with the green LED illuminating, a voltage free contact closes the path to the corresponding “OK connector”. Voting Unit trip levels, are factory preset. 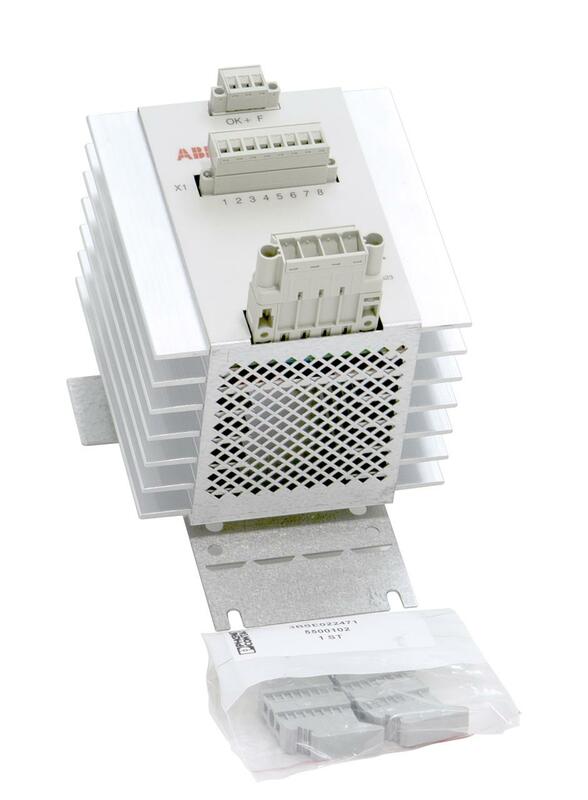 The AC 800M High Integrity and the connected S880 High Integrity I/O system (including field power) shall be supplied from a SELV or PELV power supply (e.g. SD83x) connected through the power voter SS823. The SS823 Voting Unit has double overvoltage protection circuit on input. The Voting Units SS822Z, SS823 and SS833 have been specifically designed to be employed as a control unit within a redundant power supply configuration. The output connections from two Power Supply Units are connected to the Voting Unit. The Voting Unit separates the redundant Power Supply Units, supervises the voltage supplied, and generates supervision signals to be connected to the power consumer. Green LED’s, mounted on the front panel of the voting unit, provide a visual indication that the correct output voltage is being delivered. Simultaneously with the green LED illuminating, a voltage free contact closes the path to the corresponding “OK connector”. Voting Unit trip levels, are factory preset. The AC 800M High Integrity and the connected S880 High Integrity I/O system (including field power) shall be supplied from a SELV or PELV power supply (e.g. SD83x) connected through the power voter SS823. The SS823 Voting Unit has double overvoltage protection circuit on both inputs. It is also able to detect both short and open circuit in the voting element. Mains/input voltage, nominal 1x24 V d.c.
Mains frequency 60 V d.c.